On one hand, I’m juggling the most wonderful, happy news and events and on the other, a mound of frustrations and headaches. It always seems to be this way; balancing the good and the bad. Sometimes people have the impression that, for me, everything is easy and wonderful and never a drop of rain falls from my 72F cloudless sky. But I’m human and there’s a lot going on. My trick is that I just don’t give weight that often to the negative. I’m almost Pollyanna to a fault. The upswing (see?) is that by focusing on the great, more great happens. That doesn’t mean I shy away from the challenges, I just know they’re there, deal with them, and enjoy all the good when I can no matter how big or small. It’s true that right now I don’t have my own home and that sleeping in hotels or crashing on the floors of friends is taking its toll. However, I do have a teapot I adore complete with my favourite tea and tea cosy. And every time I fill that pot I feel happy and safe. Trivial? Stupid? Probably to some who’d say, “you don’t even have your own place to unpack your things and you’re going to be satisfied with tea?” But at this moment – 1:00PM to be exact – I’ll take what I can get. And that’s a great cup of Earl Grey. I’ll take on all the moving bits, the workload, the phone calls, the meetings in awhile. Right now, it’s just a beautiful time for tea. So while enjoying that tea I took a break and discovered The Library of Congress Flickr Photos (and if you haven’t yet seen them, I highly encourage to you to peak and if you can, participate). 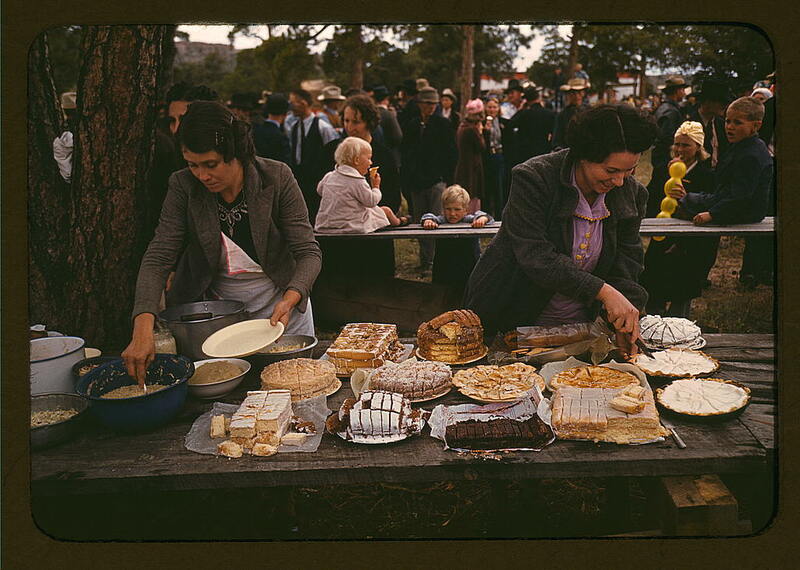 Somewhere in the middle of it all, I came across a series of photographs by Russel Lee who was sent by the U.S. Department of Agriculture to on Pie Town, New Mexico, to document the effects of the great depression. Whilst browsing the photographs, and without knowing that much about it (I learned only of the history after reading this great article in the Smithsonian), I saw a community, I saw people working, I saw people making things, living simply, living well (did you see all those pies, that amazing quilt?). I saw the old and new mixing (the horse pulling the car out of the ditch – brilliant!). I saw a lot of things I talk about on here, only these things were taking place almost 70 years ago amongst very hard conditions. I think sometimes it’s easy to think that living well will be achieved when only one has a, b, or c or has done x, w & z. Sometimes people think living simply means forgoing everything or having everything done for you. I think living well, living simply, living hygge is a state of mind that is found in every situation – good or bad. It’s about making the most out of your life whether you’re on vacation in the Bahamas or struggling in a dingy studio flat. It’s hoping almost to a fault that things will get better so you wear your good clothes to an outdoor fair, laugh with your neighbours, bake that pie and then take on the worries of tomorrow, tomorrow. Life is very seldom ever totally perfect or totally bad – there’s always beauty and a way to be content. The trick, I think for all of us, is just to look for that. To celebrate even when we don’t think we have reason. To give when we think we have nothing to give. To help when we don’t think we have anything to offer. To live, not when things are perfect, but right now, the best we can. My son and his family have moved to another country but have been without their furniture and most of their toys for the children and clothing for weeks. Their things still haven’t been sent but they are finding how little they can live without. I hear you—whenever I move to a new place, especially a new country, a tea kettle is the first thing I buy. There’s something so comforting and homey about being able to make yourself a cup of tea. Lovely, lovely photograph, A. Wholly inspiring. I’m a firm believer and true practitioner of living your life now. My parents are artists and inspired us to live an artful life and not the perfect one that we thought everyone else must have. I still don’t have a perfect home, but it’s always the one all our friends love to visit and always comment on what a great energy the house has. That may be the best compliment of all.